COLOR HISTAGRAM, FOREGROUND DETECTION, SEAMCARVING. 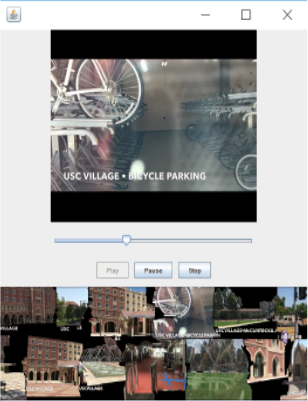 Downsampling and upsampling of images. Implemented Gaussian Smoothing, Bilinear Interpolation and Nearest Neighbor interpolation algorithms in JAVA to resize any given image. 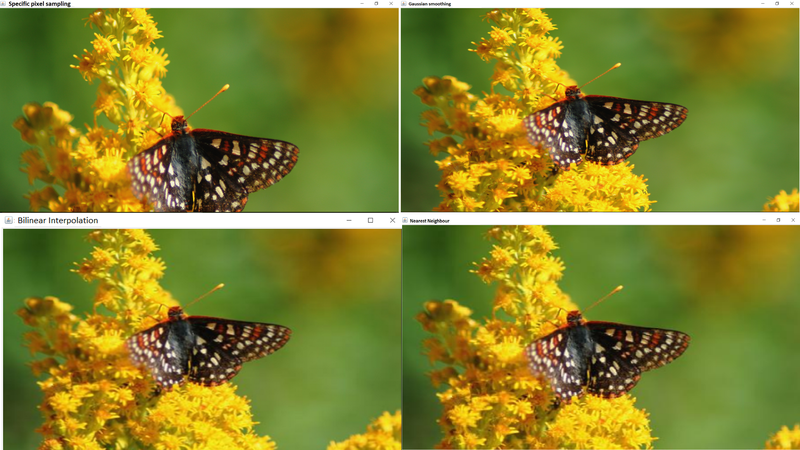 By reading a buffered RGB image(.rgb extension images) and displaying the output image on a JFrame and saving output image in png format. Discreet Cosine Transformation and Discreet Wavelet Transformation of images. 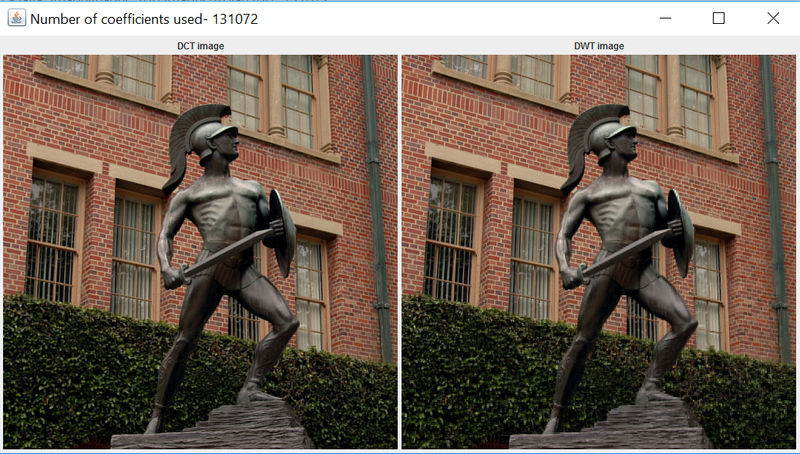 Developed a JAVA Program to compress any image using Discrete Cosine Transform(JPEG) and Discrete Wavelet transform(JPEG 2000). Designed an event-based connector to help users to seamlessly and automatically share their activities/updates on various social media. Any activity on one social media (for example: Facebook) is automatically posted/updated on another social media (for example: LinkedIn). The new location is added as a saved place in Google Maps, thereby making it simpler to explore nearby places. When a Facebook user likes a particular album/track on Facebook, the track is automatically added to once Spotify Playlist. The architectural style in use is the “Publish Subscribe” style. This connector is highly scable by introducing any number of producer or consumer on the fly. To make our connector more flexible and extensible, we introduced selective publishing by blacklisting the consumer from producer side, to whom the message should not be passed. For example the publisher, Facebook can blacklist LinkedIn saying current location update event should not be published to LinkedIn but only GoogleMaps should receive the event published. Producer will only mention the name of the consumer he need not know if consumer exits or not, in this case our connector will take care of blacklisting the consumer if exists. Each consumer is given with permission to access message published on topic, this access token is stored in database. To conclude, this project focused on balancing architectural relevance with architectural novelty. It started with identification of a problem and selection of the architectural style(publish subscribe and event based connector) that best suited the applications. 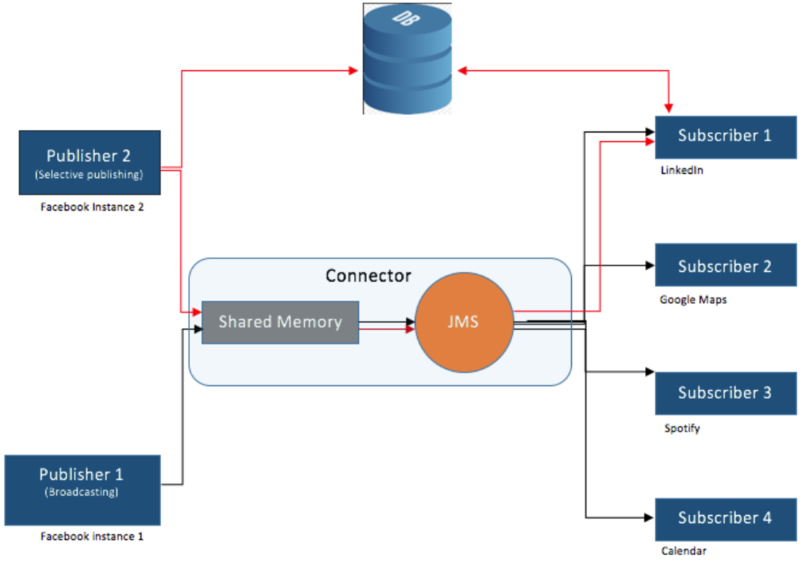 In order to demonstrate the connector’s extensible, a subset of the system functionality was implemented using a completely different architectural style. This application is hosted on AWS server, click here to access application. Facebook Search application provides the functionality to search on Facebook based on User, Pages, Events, Groups, Places. On clicking on search button the result is fetched from Facebook. Each row in the result contains Profile photo, name , favorite star and details (">"). Clicking on favorite start user can make the selected result as favorite so that it can be viewed later. Clicking on Details arrow it goes to internal page which contains Albums and posts. There are 5 ablums displayed with recent 2 photos in each album. Also it contains 5 recent posts Favorites tab includes the result which contains the favorited user. Whole application is build using bootstrap and angular JS, making the whole website responsive for mobile browser and on web page. Data from facebook is fetched using FB SDK using PHP file and JSON parsing. Implementation of Favorites is done using local storage of the browser, to store users favorite results, so that it can be viewed later. Since this application is hosted on AWS server, it can be viewed and accessed by anyone. 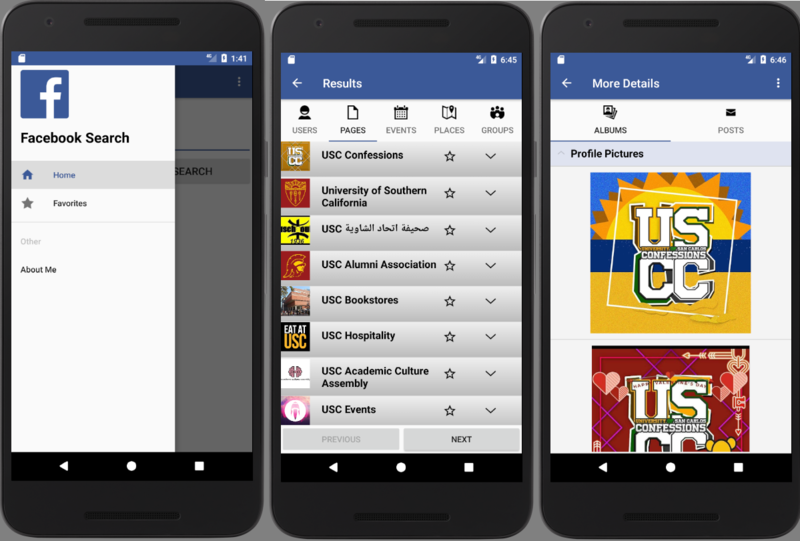 Facebook search Facebook search android app, is developed using android framework and android facebook SDK. This app also includes preferred storage and FB share. This app includes nav slide containing home, favorites and about me. Clicking on search button in home page the result is fetched from Facebook and displayed on 5 different tabs basically Users, Pages, Events, Places, Groups. Each result row consists of profile photo, name, favorite indicator and details imageView. Clicking on details Image view, albums and posts page is displayed which contains 5 ablums with 2 recent photos in each album, it also contains 5 recent posts. There is add to favorite and share option included in menu option, clicking on add to favorite, the selected result will be stored in preference storage which can be viewed later and clicking on share option user can post on Facebook wall. whole application is build in android using android FB SDK. Places tab fetches the data from users current locations nearby places. Since peferred storage is used users favorite is saved in app until it is removed by user. 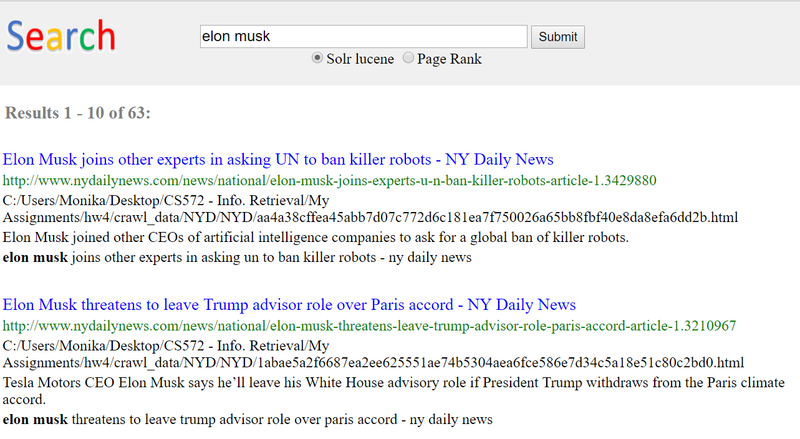 Built a completely functional, fast and easy-to-use Online news search engine using Lucene and PageRank algorithm. Crawled webpages from multiple news sources (USA Today, NY Daily, etc.) by downloading images, HTML, PDF and word files. Built an Inverted Index table using Hadoop Map Reduce framework and implemented the News Search Engine using NetworkX library (Python), Apache Solr Lucene, and PageRank algorithms using JAVA & Python. News Search Engine has AutoComplete, Spell check and Snippet display features. Managing, Design thinking and Leading the team. Created an Online Bookstore website using bootstrap, PHP, HTML, and CSS. Website was developed with publish-subscribe architecture, and to send automated notifications (via e-mail and text message (SMS)) to a customer when a new book is added to the online bookstore. I worked as manual and automation test engineer for Onboarding product. Onboarding product functionality allows customers to finish New recruit’s paperwork before joining the company, Onboarding as a product is very user friendly and can be configured as user requires. Onboarding import allows large amounts of data to be entered into the system at once, so that when company hires large number of employees, everyones onboarding activity can be started at once. Compliance allows new recruite to complete there work country related paperwork activities. E-verify helps the company to verify New recruits identity with DHS, for employement verification. Onboarding helps the recruiter to verify the candidates documents on the day of orientation. Offboarding helps the employees to complete there paperwork and formalities before leaving the company. Onboarding is integrated in between of Recruiting and Employee central, where Recruiting product helps the recruiter to start the hiring process of the candidate and Employee central helps the HR to maintain the profile of the candidate in a company. Testing includes features like new generation SAPUI5 for Onboarding dashboard, Import of data from BizX to Legacy Onboarding with PGP Encryption, SOAP and REST API’s, Funcationality testing, Integration features from Recruiting to Onboarding and Onboarding to Employee central. Developed various testcases for onboarding product on UI automation, sanity and regression use cases, using selenium and java programming language. I lead a scrum team in delivering usable software, every takt based on Scrum, Agile, and Design Thinking concepts. In my day-to-day planning, review, testing, and retrospection activities I used tools such as Jira, Version One, Testlink, Confluence and many more to effectively plan and monitor the backlog items, development tasks, and testing tasks. I was responsible for product standards compliance such as performance, security, accessibility, usability, and timely delivery of quarterly shipments to customers in co-ordination with product manager, program manager, and line manager. I individually based on personal interest had developed a macro in VBA for monitoring the deliverables and defects on day-today basis, which helps the QA Managers, QA Leads & team to get in to the insights of daily trend of deliverables and Defects which helps team to analyze the trend of QA & Dev tasks pending and improve the execution strategy in upcoming days. Understand the project requirement specification and test based on the requirement. 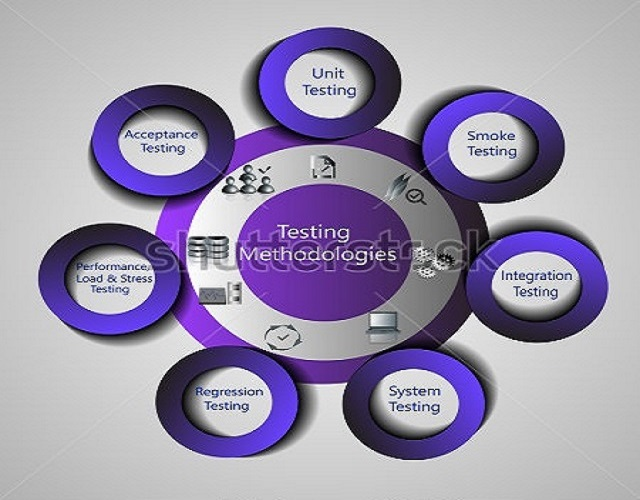 Identify the test scenarios and converting the same into test cases and maintaining same in test management tool like TestLink. 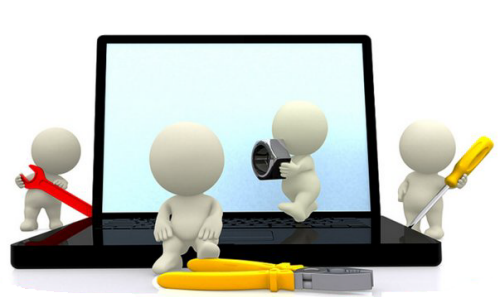 Perform functional testing, System testing and validate the components developed to make sure they are in line with the requirements and suggest any changes with respect to the same. Regression testing of the existing code when new functionality is added as part of the program engagement. Perform Database testing, SQL queries using SQL developer. Perform cross platform testing & compatibility testing on different browsers. Log issues in project and certifying them soon after fix happens. Work with developer to solve the blockers for major defects. I worked as remote Intern for IBM BPM.